Greenridge Botanicals is at the forefront of herbal medicine in Australia, creating a wide range of natural herbal remedies. Greenridge pioneered the production of organically-grown Echinacea in Australia, introduced Bilberry and was the first company to grow and market a commercial Ginkgo extract. 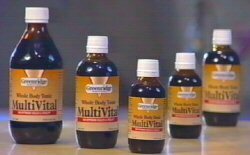 Now Greenridge Botanicals has launched Multi Vital the first truly natural whole body tonic. Most Multi vitamins are designed to compensate for a dietary deficiency. To make you feel normal. Greenridge Multi Vital is a superior formulation of 15 herbs designed not only to bring you back to normal but to boost you to a whole new level of health and energy. Greenridge Multi Vital is a truly naturally derived, whole body tonic for busy vital people. So what sot of person would need the sort of lift you could get from Greenridge Multi Vital? Anyone who has to work a lot, has more than one job, or likes to burn the candle at both ends. In fact, anyone who feels fatigued and wants to feel more energetic and get the most out of their life. Greenridge Multi Vital contains superior ingredients from all over the world and is designed to help restore and optimise the delicate balance between mind and body that governs our daily performance and efficiency. Greenridge Multi Vital is designed to invigorate your whole body and give you a healthy feeling of well-being. Adults take 10-15 ml in small amount of water, in the morning preferably before breakfast.